This pamphlet describes a unique display of stones and other building materials erected in a London school playground as a teaching resource. Gradually it will become part of school life, incorporated in the Science, Design & Technology, and Humanities courses, while still remaining a place of general interest and enjoyment. Other schools, colleges and local authorities may like to echo this work. Understanding the origins of our man-made environment is valuable knowledge for every child. One pioneering school in London has decided not only to keep a library of books and to exhibit drawings, but also to have a collection of basic rocks of the earth. These design plans show the very first educational geological garden being created by North Westminster Community School from an idea conceived by retired teacher Jack Whitehead and backed by support and advice from RTZ. Designed by architects Cullum & Nightingale, the walls feature mined stones and rock which are the source of building materials and metals in common usage in the modern world. Uncut slate is contrasted with slates cut for a small roof; roughly hewn limestone is set against the smooth stone of a bench; and chunks of un-worked sandstone in the walls are seen close to an eroded piece of statuary. 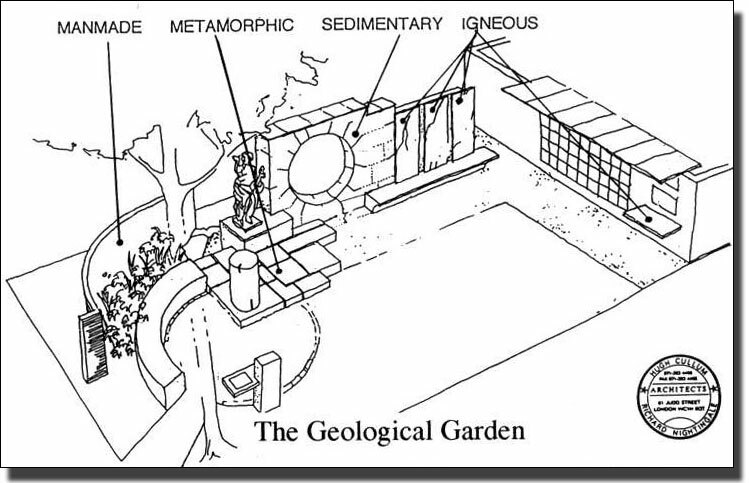 This impression of the Geological Garden could have been drawn by Osbert Lancaster. It is very like his drawings of buildings and houses for his book 'Home Sweet Home', a book even he never bettered. Indeed this pamphlet on building materials and 'Home Sweet Home' could be read together. They are both devoted to one thing: making it easier for us to enjoy the buildings that make up our local streets. 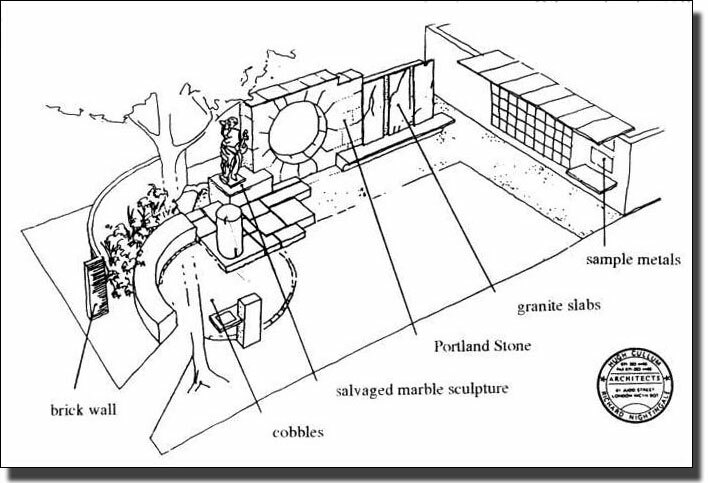 The Geological Garden, set in the school playground, is an open space bounded by three walls. On the right is a yellow brick wall; in the centre a monumental wall in Portland Stone with panels of granite and, on the left, a curved brick wall with small examples of different building stones and tiles built in. There are three great classes of stone, igneous, sedimentary and metamorphic. Igneous includes granites and gabbros, the rocks which welled up through the earth from the central molten core and then cooled. Sedimentary rocks are the limestones aid sandstones, flints aid conglomerates which have been laid down in layers by water or wind. Metamorphic rocks are ones which have been transformed by heat and pressure into new forms of rock. Limestones thus become marbles; mudstones become slates. When we are talking about building materials we must add to these three groups of stones, five more classes. First come wood and the materials used for thatching, such its wheat - straw, reed, and heather, all used in early British buildings. The school has been promised a huge timber beam from an old house in Essex Road, Islington, which will be placed as a bench in the garden, so that people can see and touch a really large piece of timber. Second, are bricks and tiles in all their different shapes and colours, made from clays of many types. Bricks have been the traditional London building materials from Roman rimes acid we have also bricks from other areas. Third come the concretes, made from sand, lime, gravel and cement, again made from local London materials. Today they are used with steel from the next group to form ferro-concrete. Fourth are the metals, iron and steel, lead, copper, aluminium, cast iron arid wrought iron. Many are used in sheets as roofings, with corrugated iron going rusty, copper turning green, zinc grey, and lead, which starts as silver, turning later to a dark grey. Wrought iron is the traditional decorative material, full of curves and twists and flights of fancy, but was also used for construction. Cast iron was the great mass-production material of the Victorians. It was a most adaptable material. Complete houses were built of cast iron: many Victorian public buildings which appear to be brick were built entirely in cast iron as a fire precaution and have mere fronts of brick or stone. You could snake anything of cast iron, drain pipes, water mains, railway stations and gravestones. One iron founder made himself a cast iron bowler hat. Fifth are plastics. Gradually plastics are being accepted in place of more traditional materials. With the use of plastic water and gas pipes, plastic gutters, plastic baths, etc, plastics are taking the place of cast iron as the cheap mass-production material. At the same time plastic membranes are being used in damp-proof courses to replace the traditional asphalt. So far as possible, the different classes have been arranged in groups across the garden, with Igneous on the right, Sedimentary next, followed by Metamorphic in the dais and path and Brick at each end. We hope that this display will be visited and revisited by children anti adults, consulted like a library, used as the starting point for projects, added to, acted in - for it is a natural stage - and so made familiar by use. There is easy access from the street for visiting local schools, and wheelchair access. Everyone can find something of interest while, when tired, it is a pleasant place for quiet sitting.